When the removal of extra sand and debris requires pushing your downhole motor to the max, rest assured that you have more flow available with the Water Bypass Sub from Tempress Technologies. With the WBS tool, operators can run higher flow rates in large well bores and horizontals and fully clean the well without over-speeding their motors. A proprietary analysis program supplied with the Water Bypass Sub allows the operator to select the correct port size for the job. Integrated into the MGS™ software, once all pertinent parameters of the job are entered, the program allows the user to select the appropriate orifice size by calculating and displaying key performance characteristics. 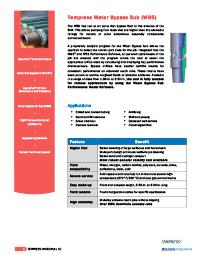 Bypass orifices have carbide inserts for consistent performance on long runs. These inserts have been proven to survive weighted fluids or abrasive additives. This simple sub has two to six ports that bypass fluid to the annulus of the BHA. This allows pumping flow rates that are higher than the allowable ratings for motors or other equipment connected below. The tool’s compact length does not impact make-up of the BHA.